Their investment needs to last. They’re not going to finance their cars if their cars keep breaking down — or, even worse, getting into accidents! So ensure that they’ll be all set beyond even that of a warranty and give them a reason to feel okay about shelling out all that money in the event that something happens to their vehicle. 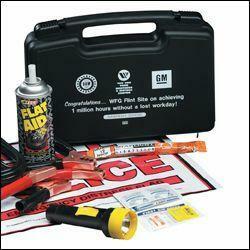 That’s where the custom printed auto first aid kits come into play. When they sign up and buy, they get that gift that’ll last them, well, a lifetime (or at least the lifetime of their finance agreement). Any auto dealer salesperson would agree that the money’s in your accounts constantly keeping up on their payments for good reason. Because they love their cars; and because they love where they got their cars from! Your dealership. The kind of pricing you can get for any custom printed auto first aid kit would be like pennies to the recurring monthly payments of a new driver out of your store. Well worth it. All you need to do is check out BRAVA Marketing, grab the keys and have a test drive with any of the designs we have on the site right here. Then contact us!